Controversial gospel singer Ringtone Apoko has vehemently denied that he is destined for rehab as reported by Chipukeezy. The NACADA board member and comedian shared a photo posing with Ringtone and said that he had accepted to go to rehab. Chipukeezy is a comedian just making fun. He is trying to make people laugh. Mimi maybe ni mgonjwa, Huyo mwenye ananipeleka hospitali anafaa kukuambia ananichukua saa ngapi ananipeleka saa ngapi kwa sababu yeye inaonekana anajua kunishinda. Ringtone’s recent social media posts have left many wondering whether he was okay. We asked him if he was battling depression or suffering from mental health and he didn’t like the question. ‘Why would you imagine I am depressed? What’s wrong with my social media posts?’ he posed before hanging up on us. 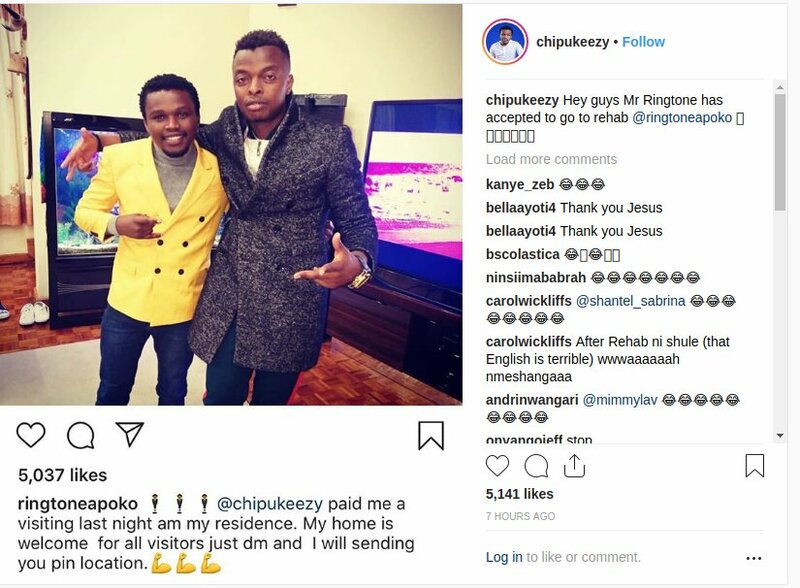 Earlier before announcing that the Pamela hitmaker has accepted to go to rehab, Chipukeezy commented on one of his posts saying he would use every available force – if necessary – to make sure he goes to rehab. Those are jokes. Ringtone is my friend we were together yesterday. He [Ringtone] didn’t tell me to post. It’s my page I post what I want. The question many are asking is, how would a member of NACADA joke with such a sensitive topic? Why did he say Ringtone had accepted to go to rehab yet he’s not a drug addict? Do you think such serious matters/sensitive topics should be made fun of? Leave a comment below. Previous Post: G-money schools shoddy DJs how to mix without irritating drops , His new mix is on fire.